Samsung has just unveiled the latest addition to their Xcover lineup of rugged phones and it is by far the most exciting to date. 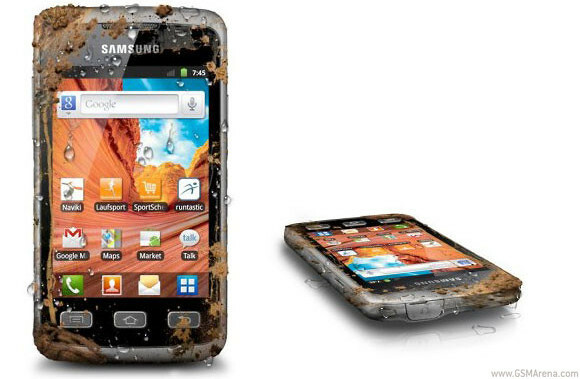 The Samsung Galaxy Xcover is an Android 2.3 Gingerbread smartphone with IP67 standard certification, meaning it's fully dust and water resistant, and it's also shock resistant so you won't need to worry about dropping it. The Xcover series by Samsung have so far been only dumb phones with next to no functionality outside calling and texting, but this latest unit runs Android and aims to challenge the Motorola Defy and the Sony Ericsson Xperia Active. We don't have the full specs sheet yet, but we can confirm that the Samsung Galaxy Xcover has a 3.2 MP camera with LED flash that doubles as a flashlight, Wi-Fi, GPS, HSDPA up to 7.2Mbps and, finally, a 3.65" scratch-resistant display of tempered glass. Oh, and the phone can stay as deep as 1 meter under water for 30 minutes. So far we know the phone will hit Germany in October, but unfortunately, nothing on its pricing. Man we can't wait to take this one for a ride. Defy+ is out about the same time - come on Samsung, I've been loyal these past 7 years... I need Android and rugged!